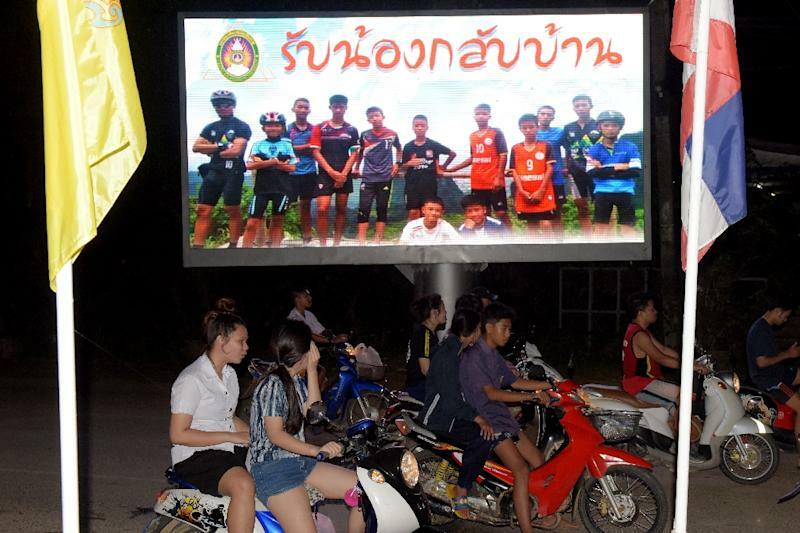 Chiang Rai (Thailand) (AFP) - Thailand celebrated the successful mission to free 12 boys and their football coach from a cave Wednesday, with the nation heaping praise on the rescue team as the triumphant tagline "Hooyah" pinballed across social media. The rescue received blanket coverage in Thai media with newspapers The Nation running a "Hooyah! Mission accomplished" and the Bangkok Post emblazoned with "All Wild Boars saved"
Their ordeal gripped the world, with the lives of the boys aged 11 to 16 and their 25-year-old coach hanging the balance as the threat of heavy rain injected urgency to an already perilous extraction bid. But they were prodded into the dangerous task of 'diving out' the team through submerged chambers and claustrophobic passages as oxygen levels in the cave plummeted and rains menaced. The group were led out in three batches by a team of 13 international divers flanked by the Thai Navy SEALs, who greeted each successful rescue with a "Hooyah" on their Facebook page. The boys and the coach are in quarantine in Chiang Rai hospital, apparently in good spirits despite their ordeal. On Wednesday a few hundred school children gathered opposite the hospital, looking up at the building that will be home to the rescued football team for the coming days. 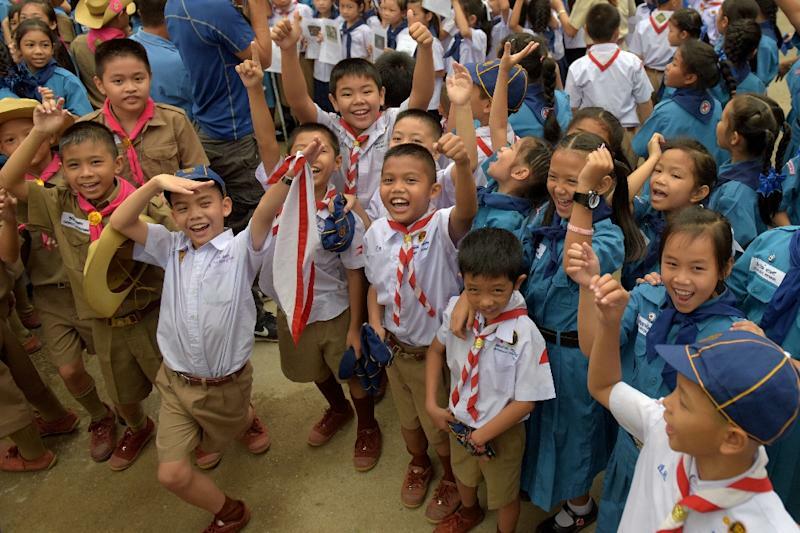 Their teacher led them in a chant thanking "everyone who came to help make the mission succeed," in a small reflection of a wider gratitude towards the foreign experts who helped extract the stricken group. 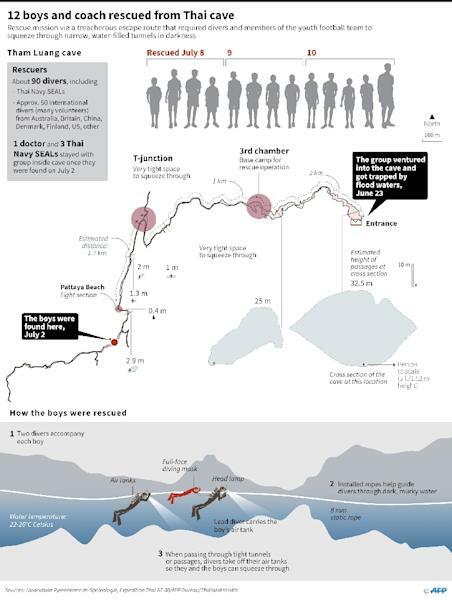 Authorities have shrouded the details of the rescue bid in secrecy, with fragments of information emerging about the heroic efforts of the dive team. The dangers of the rescue were brought into sharp relief last Friday by the death of a retired Thai Navy SEAL as he ran out off air in the flooded cave complex as the extraction plans were being laid. "I'm very happy and relieved. I haven't been able to sleep for days. I'm happy that the boys are out too," Khamluh Guntawong grandfather of the team coach Ekkapol Chantawong said. "Ekk really loves and cares for the boys," he added, of a figure who is emerging as something of hero despite being the only adult to accompany the boys into the cave on June 23. The group became trapped in rising floodwaters and were found nine days later emaciated and dishevelled on a muddy ledge, with water lapping ominously below. The saga captivated a global audience for over two weeks, rewarding them with a remarkable happy ending. French football star Paul Pogba dedicated his country's World Cup semi-final victory over Belgium to "the heroes of the day, well done boys, you are so strong" he tweeted.